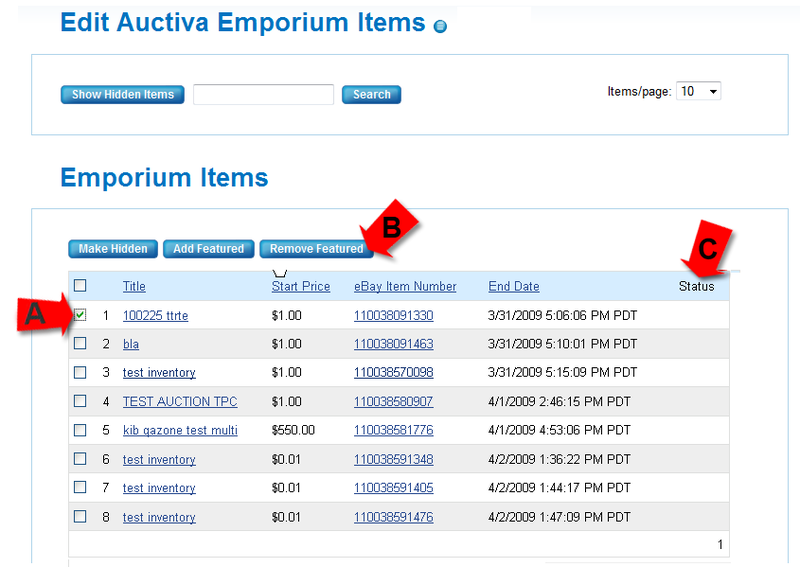 Your Auctiva Emporium allows you to display active items that buyers can purchase. You can hide items, or display items in the featured section. This tutorial will show you how to edit your Emporium items. 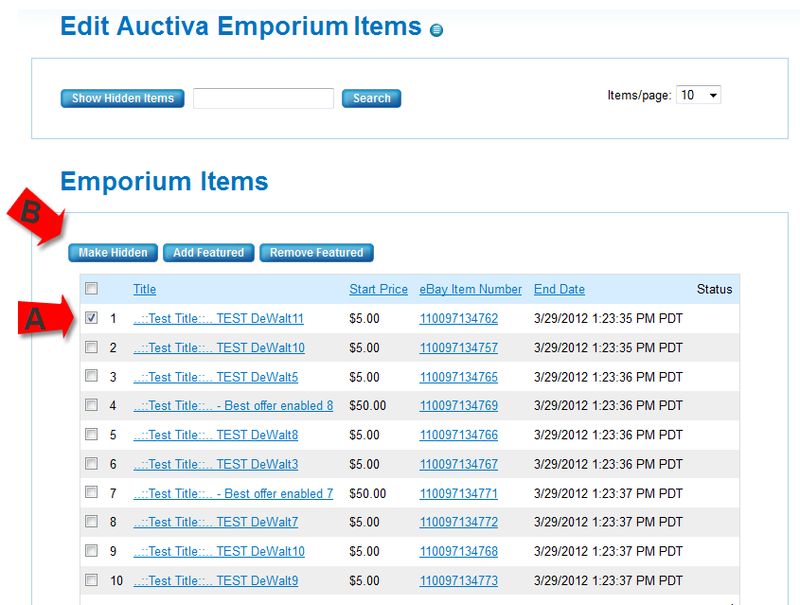 By default, all active listings will appear on your Auctiva Emporium. Step 1. Go to the Edit Auctiva Emporium Items page. 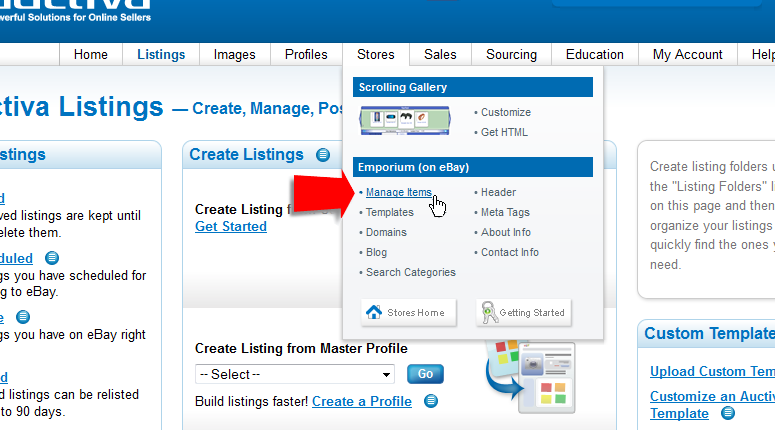 Hover your mouse over the Stores tab and click on the "Manage Items" link (Figure 1). The Edit Auctiva Emporium Items page will load. Figure 1. Go to the Auctiva Emporium Items page. Step 2. Hide Emporium items. In this step, you can choose to hide Emporium items. Choose an item to hide by selecting the checkbox next to the item (Figure 2-A). You can choose multiple items, if necessary. Click on the Make Hidden button to hide the selected items (Figure 2-B). Figure 2. Select items (A). Click on the Make Hidden button (B). Step 3. Show Emporium items. In this step, you can make hidden items visible on your Emporium. Click on the Show Hidden Items button (Figure 3.1-A). All hidden Emporium items will display. Use the search field to refine the results, if necessary (Figure 3.2-A). Choose an item to make visible by selecting the checkbox next to the item (Figure 3.2-B). You can choose multiple items, if necessary. Click on the Make Visible button to make the selected items visible (Figure 3.2-C). Figure 3.1. Show hidden items (A). Figure 3.2. Search for hidden items (A). Select hidden items (B). Make hidden items visible (C). Step 4. Feature Emporium items. In this step, you can choose which items to feature on your Auctiva Emporium. Make sure you are viewing visible items and not hidden ones. Choose an item to feature by selecting the checkbox next to the item (Figure 4-A). You can choose multiple items, if necessary. 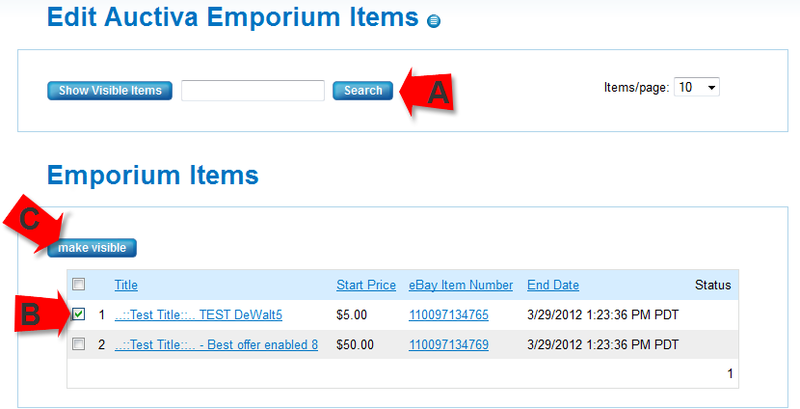 Click on the Add Featured button to feature the selected items on your Emporium (Figure 4-B). The items will display a "Featured" status (Figure 4-C). Figure 4. Select items to feature (A). Click the Add Featured button (B). Featured status (C). Step 5. Remove featured items. 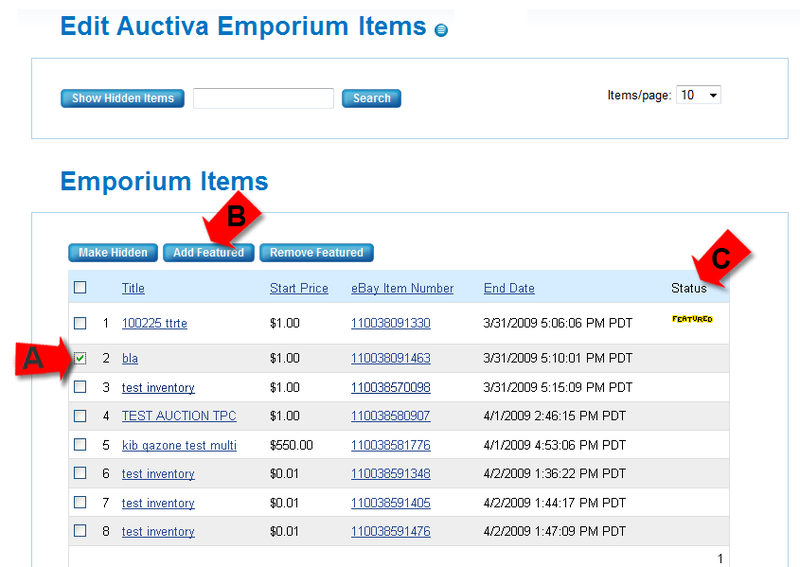 In this step, you can remove Emporium items from being featured on your Auctiva Emporium. Choose an item to remove from the featured section by selecting the checkbox next to the item (Figure 5-A). You can choose multiple items, if necessary. Click on the Remove Featured button to remove the selected items (Figure 5-B). The items will no longer display the "Featured" status (Figure 5-C). Figure 5. Select items to remove (A). Click on the Remove Featured button (B). The "Featured" status is removed (C). 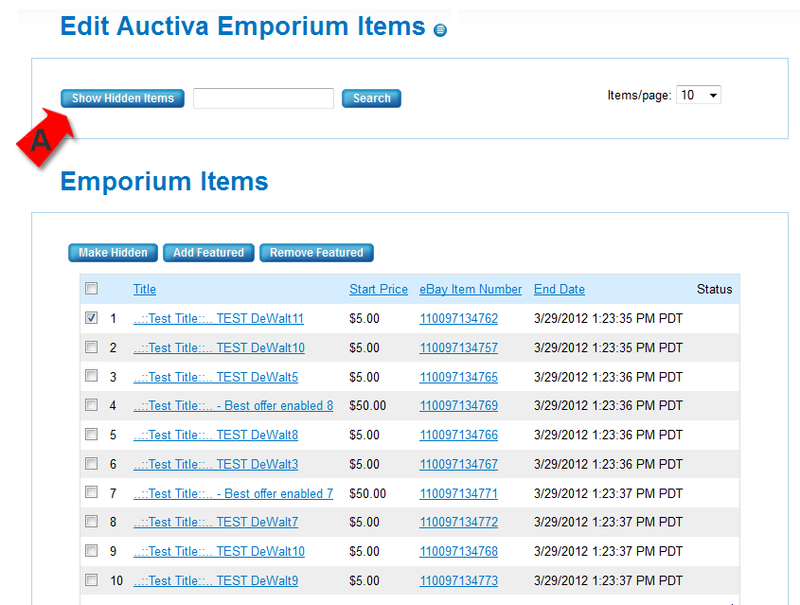 This completes the task of editing Auctiva Emporium items.